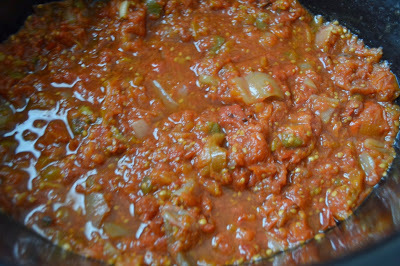 Big batch of summer tomatoes and no time to make a slow simmered marinara sauce? Let your Crock Pot do the work for you! Toward the end of summer, I am about pooped out from making and canning all things tomato related: Salsa's, sauces, and more. 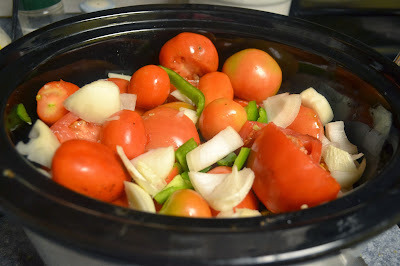 So when time is short, and so is my energy, I literally dump my garden bounty into the slow cooker and whip up a batch of tomato sauce with little effort. This is more of a method than an exact recipe. I really wing it with some basics and what I have on hand. But I'll give you a recipe to work with . 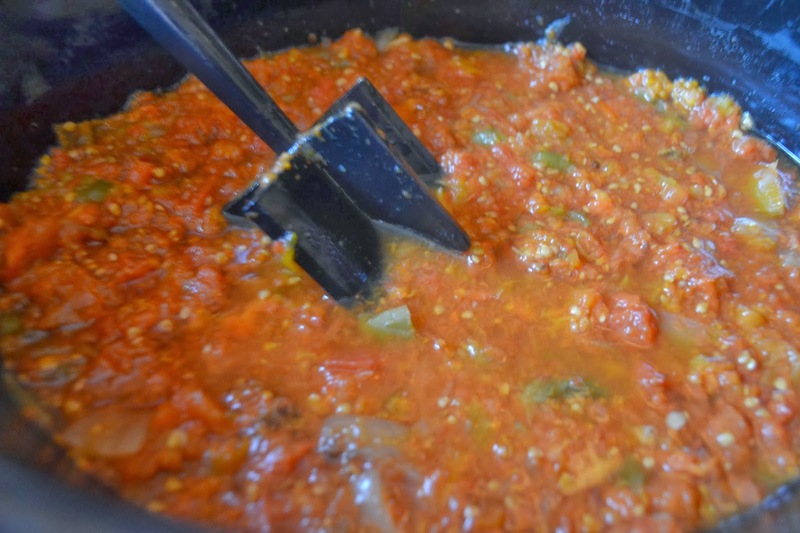 Jan's Tip: This batch I was using all the tomatoes I had left at the end of summer: Big juicy slicers, as well as my paste (plum or Roma) tomatoes,so the water content varies at times depending on the type of tomato you toss in there. And to answer a question you are going to ask: No, I don't peel them at all! 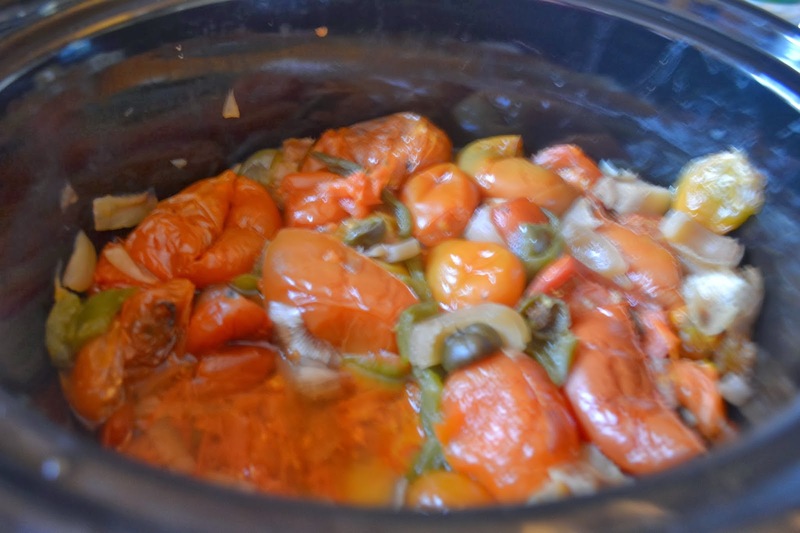 I just leave them in, and blend them right into the sauce, but you can filter the skins out also at the end of the recipe. 1 lb. 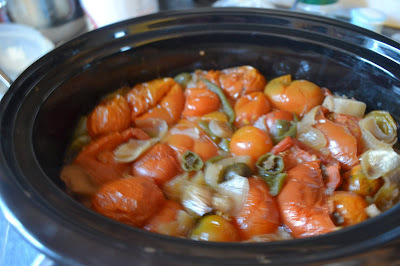 = 3 medium round tomatoes, or 8 small plum/roma tomatoes, or 2 cups chopped diced tomatoes. Remove lid, and cook on high an additional 8 hours uncovered until vegetables are soft, most of the water from the tomatoes has cooked/evaporated away and the remaining juices are mostly concentrated tomato juice rather than water. You can run batches of your cooked tomatoes through a blender,foodprocessor or immersion blend right in the crockpot. You can run it through a food mill to remove as much skins and seeds as possible. Use a food masher and just mashed it into a super chunky sauce to go in batches of chili's and soups.